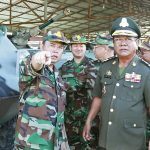 Nearly 20 Royal Cambodian Armed Forces officers have been promoted to brigadier general, a move a military expert said would help ensure the army’s loyalty to the government. 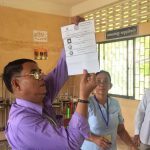 The National Election Committee (NEC) continued on Tuesday to say slow internet and blurry photographs were to blame for delays in publishing election results for 344 remaining communes, with its spokesman offering no timeline for when the public could expect complete results. Some parties and observers questioned why the process was taking so long. 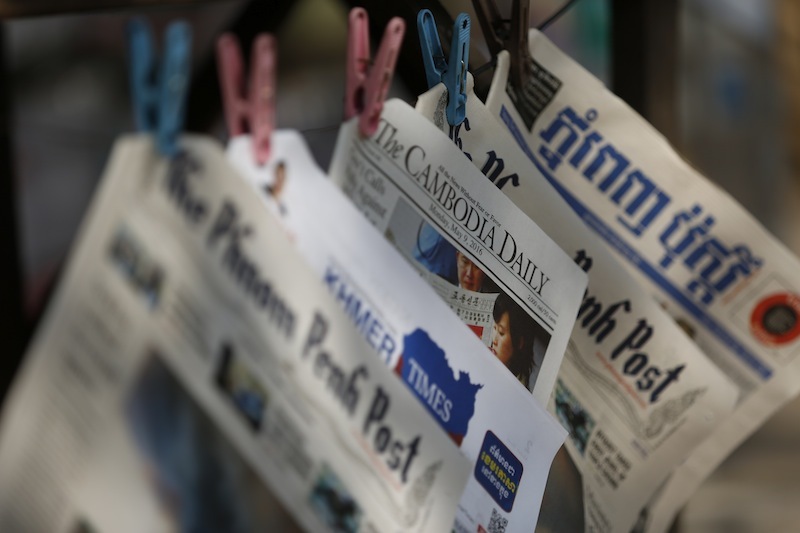 Two Cambodia Daily journalists accused of incitement and violating voters’ rights for asking questions in advance of Sunday’s commune elections in Ratanakkiri province will likely be summoned for questioning after Election Day, a provincial court prosecutor said. 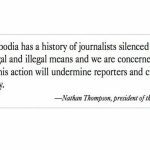 A complaint against two Cambodia Daily journalists accused of incitement and violating voter rights by asking questions about Sunday’s commune elections has been rejected by a prosecutor at the Ratanakkiri Provincial Court due to a lack of evidence. An opposition commune candidate in Pursat province has been fined more than $6,000 for his conviction in a defamation case that CNRP officials say was politically motivated. 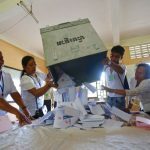 The ruling party filed 15 complaints to commune election committees against the opposition for minor campaign infractions, compared to five from the CNRP, during the first four days of the election campaign, the National Election Committee (NEC) said on Wednesday, with half already settled through compromise. 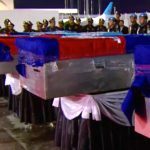 Cries of pain filled the air at the Choeung Ek Genocidal Center on Thursday as performers re-enacted events from the Khmer Rouge era during an annual ceremony that blends historical remembrance with pro-government politics. 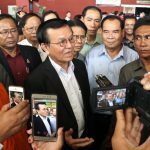 CNRP President Kem Sokha arrived home on Tuesday from the U.S., where he met with officials in the administration of President Donald Trump and raised funds for the party during a 17-day trip to more than a dozen states. Authorities in Svay Rieng province on Wednesday said the latest outbreak of foot-and-mouth disease had been brought under control by timely treatment, though their numbers on how many cows the contagious virus had infected varied wildly. 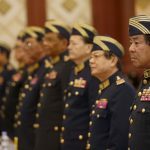 Interior Minister Sar Kheng wrote a letter to Prime Minister Hun Sen on Tuesday requesting he approve the retirement of eight high-ranking police generals. 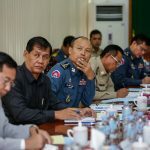 In what appears to be the government’s first official admission that a crackdown on the illicit timber trade is failing, the Agriculture Ministry on Tuesday ordered its provincial offices to address what it called a recent spike in illegal logging and trafficking. 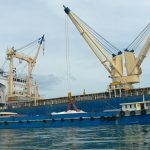 The Mines and Energy Ministry on Friday defended sand exports reported last week by an environmental NGO, saying Cambodia’s sand ban did not include the type seen in a video being loaded onto vessels off the coast of Sihanoukville. The Ministry of Mines and Energy on Friday defended sand exports reported this week by an environmental NGO, saying Cambodia’s ban did not include the type of sand seen in a video being loaded onto vessels off the coast of Sihanoukville. 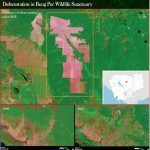 A new satellite image of central Cambodia shows continued clear-cutting of thousands of hectares of healthy forest inside one of the country’s protected areas, five years after the government announced a major crackdown on such logging by rubber plantations.